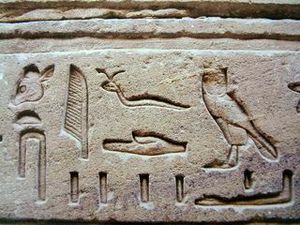 Egyptian hieroglyphs (/ˈhaɪrəˌɡlɪf, -roʊ-/) were the formal writing system used in Ancient Egypt. Hieroglyphs combined logographic, syllabic and alphabetic elements, with a total of some 1,000 distinct characters. 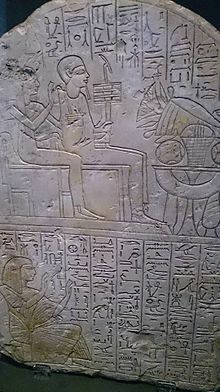 Cursive hieroglyphs were used for religious literature on papyrus and wood. 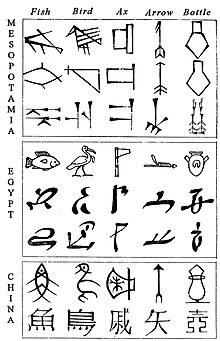 The later hieratic and demotic Egyptian scripts were derived from hieroglyphic writing, as was the Proto-Siniatic script that later evolved into the Phoenician alphabet. 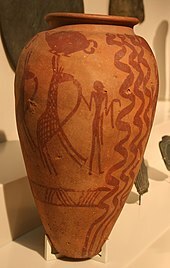 Through the Phoenician alphabet's major child systems, the Greek and Aramaic scripts, the Egyptian hieroglyphic script is ancestral to the majority of scripts in modern use, most prominently the Latin and Cyrillic scripts (through Greek) and the Arabic script and Brahmic family of scripts (through Aramaic). 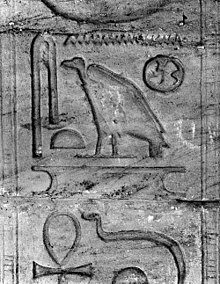 Thus, hieroglyphic writing representing a pintail duck is read in Egyptian as sꜣ, derived from the main consonants of the Egyptian word for this duck: 's', 'ꜣ' and 't'. (Note that ꜣ ( , two half-rings opening to the left), sometimes replaced by the digit '3', is the Egyptian alef).